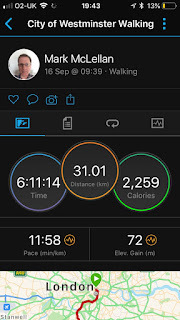 Wandling: Beer, a long walk and a short walk. We were always planning to come back to the UK in September to celebrate my birthday. But when we heard about the Wandle Fortnight we decided to bring the UK flight forward a few days so that we could take part in a couple of the events. Wandle Fortnight is a "community-led celebration of all things Wandle running from September 8th to September 23rd". Saturday was a bit hectic. 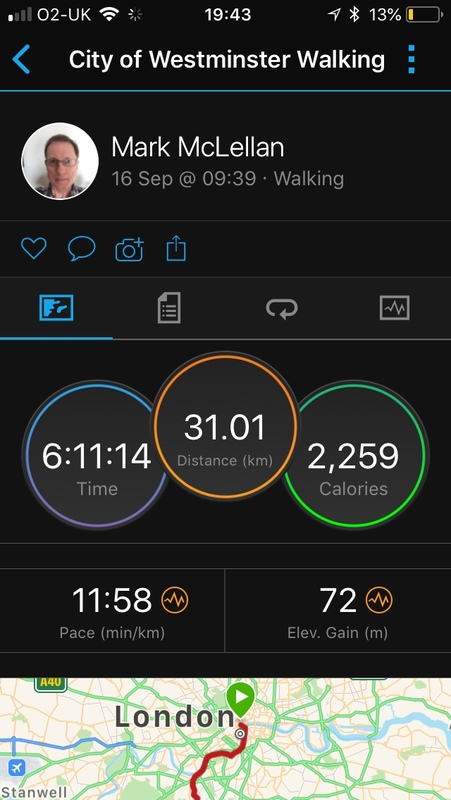 It started with an early train to Reigate to do a park run followed by a cup of tea with my sister, followed by lunch with my mother in the residential home, then a train back up to London for the Wandle Beer festival. They had about 60 beers on tasting. You got a pint glass with marks for a full pint, a half pint, and a third pint. That way, by drinking thirds, you could try a wider variety of beer. You bought a voucher for 5 pounds marked off in 10p. As you drunk your beer they scored off the relevant price 10p's. Any unused value on the card could be donated at the end of the evening to the nominated charity the Cat Protection League - a most worthy cause. There seems to be something of a trend these days for brewing IPA of which I am not great fan. So I went for the two milds that were on offer and then tried a variety of porters. It was better attended than the photo makes it look. There were a number of people seated behind me when I took this photo. We were joined for a couple of pints by our friends Gavin and Tania. When we had done enough beer tasting we headed off to Tooting Market for something to eat and a glass of wine at the always excellent Unwined. The 30th anniversary of the inaugural Wandle Trail walk from Charing Cross to Croydon. You might wonder why it started at Charing Cross. 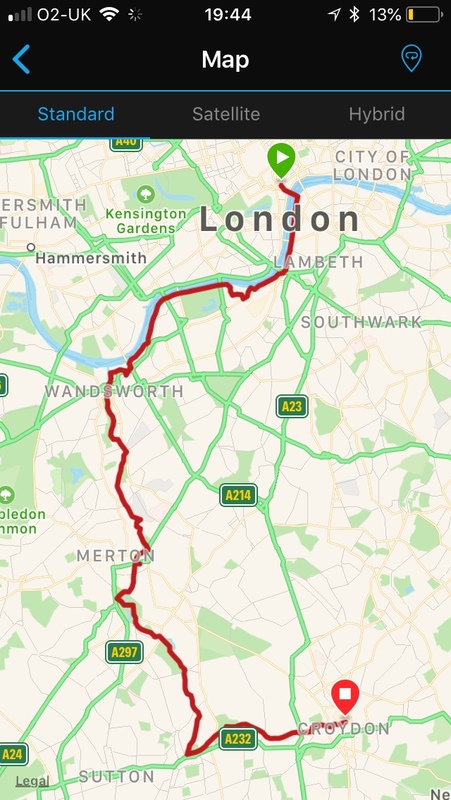 It’s because the Long Distance Walkers Association don’t think the Wandle Trail is long enough so they added on an extra 5 miles. Oh my aching feet! The newly opened promontory at Battersea Park. The Wandle Creek, now improved by the removal of the barrier . Looking the other way towards Bell Creek. 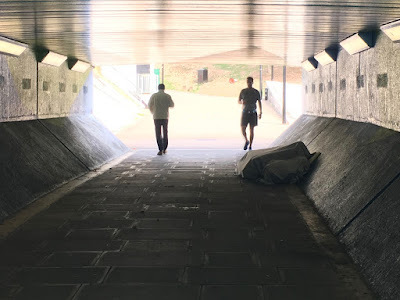 A small detour to the underpass by Wandsworth Bridge where a scene from Clockwork Orange was filmed. My Dad was a great film buff and would have loved to know I lived so close to this spot. The snuff mills at Morden Hall Park. We followed the full path down to one source of the Wandle at Carshalton Ponds and then across to the other source in Wandle Park. A long day and a long walk. The walk ended up in Croydon and we took the tram home for a long soak in warm bath. Doing stuff about Wandsworth Town centre I always like to have a peer at the ex-Ram Brewery site to see how the river is doing. A pleasant surprise to see that the site is now open and there is a foot bridge from the High Street over the river so you can now access a stretch of the river previously hidden within the brewery. The new landscaping is in full foliage. On both sides. Not very extensive, and one might even say cosmetic, but a great improvement on the previous vertical sided concrete channel. View back towards the new footbridge, Wandsworth High Street and Southside shopping centre. View towards the Armoury Way road bridge. Mapping the Mills - Walk 2. "Explore the significance of the River Wandle in establishing a millennium-long tradition of flour milling in Wandsworth. 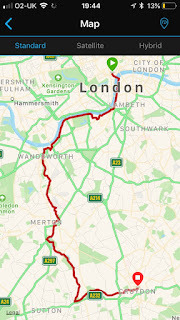 Walk, from Earlsfield Station to the Causeway, Wandsworth Town". Organised by The Building Exploratory. Not just flour mills but calico, snuff, gunpowder, and more. The reason the river was so popular was that it's steep drop made for a fast stream good for turning mills. We only walked a short stretch of the overall river but covered the area I know best. Fascinating to learn where the various mills had been and some the the political and economic history that shaped the changing industrial landscape. There are not many photos of this walk as we were too busy listening to our very well informed guide. You can read more and download a map and guide on the Wandle Valley Park Mapping the Mills page.